Large diameter HDPE pipes are tough, lightweight, shock and chemical resistant. They offer installation economy and long service life. Special pipe lengths can be product to meet almost any need, with standard lengths in 3, 6, 12 and 14m. Manufactured with recycled HDPE using a twin extrusion process, large diameter twinwall has an outer corrugated wall to provide structural strength and a smooth inner wall to offer optimised hydraulic flow. A unique integrated locking system removes the need to deepen the pipe bedding at the joint and requires just one seal per joint. Strength rating options up to 6kN/m2 are available. Contact JDP if your project requires this application. 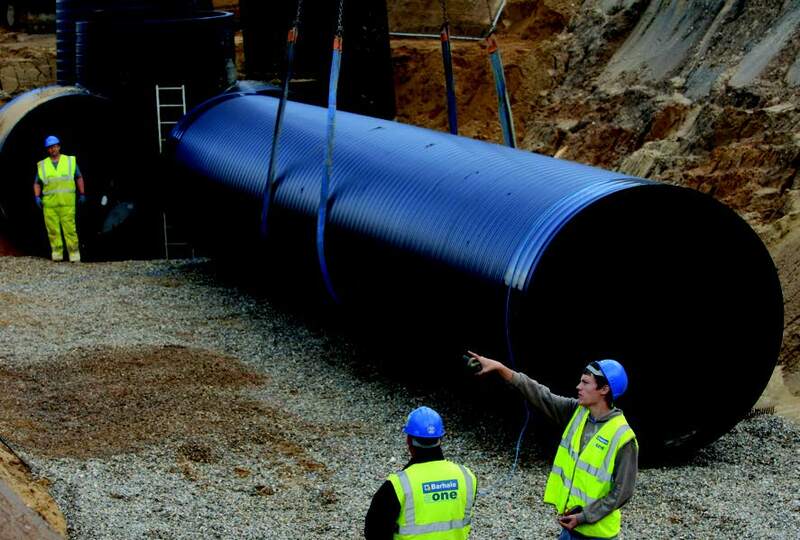 With sizes from 700mm to 3000mm structured wall large diameter HDPE suits many specialist applications such as attenuation, landfill and marine pipelines. Pipe Bedding The bedding soil must be free from stones within the breadth of the pipe trench. On the trench bottom a 150mm thick bedding layer is prepared and well compacted. For installation in soft/wet soil, a geotextile is placed under bedding. Pipe Laying — Pipe laying should be carried out in accordance with the latest edition of the Civil Engineering Specification for the Water Industry (CESWI). Prior to installation commencing, a site briefing to the developer and his installation contractor should be carried out. Inspection — Pipes and fittings should be visually checked for any damage immediately prior to installation. Pipe Jointing — The pipes should be jointed in the trench and laid on the prepared bed so that the barrel of the pipe maintains substantially continuous contact. Small depressions should be made to accommodate the pipe sockets or couplings. Once the joint is complete, these depressions should be carefully infilled, taking care that no voids remain under or around the joint. Primary Backfill — Backfilling shall be made over the whole width of the trench. Compaction of the backfill material shall be made in layers of 150-300mm. The final layer of the primary backfill should be minimum 300mm above the pipe crown. Note: No compaction is to be done directly above the pipe until the backfill has reached 300mm above the pipe crown. Final Backfill — The final backfill is done with regard to the native soil and external loads (traffic). When deemed necessary, the compaction is carried out in several layers. Please note this is a guide only, for full installation instructions manufacturers advice should be followed.